On Monday, 7 January 2013, the United Nations University Headquarters in Tokyo hosted the event “Towards Building a Sustainable Society: What is the Inclusive Wealth Index?” As the foundation of the inaugural Inclusive Wealth Report (IWR) 2012, the Inclusive Wealth Index (IWI) has garnered global attention as a novel approach to determining the long-term sustainability of nations. In his opening speech Prof. Dr. Konrad Osterwalder, Rector of UNU, introduced the IWI as a new perspective on the true state of a nation’s wealth and the sustainability of its growth. He suggested that a natural capital accounting framework needs to consider the value of ecosystem services in relation to wealth in order to achieve the Millennium Development Goals (MDGs). He also recommended that national and international agencies should increasingly make use of the IWI to measure economic progress. Shigeo Okaya, Director of the Environmental Strategy Division of the Environmental Policy Bureau, Ministry of the Environment, Japan, conveyed his appreciation of UNU’s contribution in publishing the report. He highlighted the importance of the IWI’s qualitative contribution to measuring economic growth and its shift towards a stock-based assessment. Mr. Okaya stressed the importance of measuring natural capital including various forms of ecological capital that are not commercially tradable — key considerations for the next generation to mitigate climate change and the loss of biodiversity. 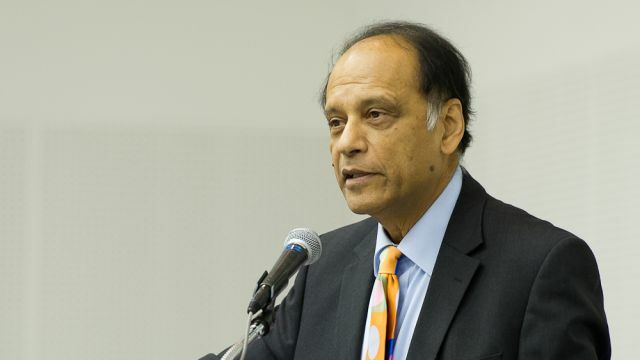 In a presentation about “Sustainability and the Idea of Wealth”, Sir Partha Dasgupta, Professor Emeritus of the Economics Department, University of Cambridge, showed that sustainability and national wealth are fundamental elements of the IWI. He stressed that the IWI goes beyond the shortcomings of traditional indicators, such as Gross Domestic Product (GDP), by assessing human wealth with a goal of enabling future generations to sustain current wealth. In Prof. Dasgupta’s view, economic assessment should not only be related to policy consequences, but also to sustainability analysis, trade-offs and shadow prices. He explained that a nation’s productive base, as a determining factor of the quality of life, consists of three kinds of capital assets — produced capital (e.g., roads, construction), human capital (e.g., population, education, health) and natural capital (resource stocks) — as well as enabling assets (e.g., institutions, knowledge). Prof. Anantha Duraiappah, Executive Director of the United Nations University International Human Dimensions Programme on Global Environmental Change (UNU-IHDP), presented “The Inclusive Wealth Report 2012: Findings and Policy Implementation” and the significance of its results based on findings from 20 countries. He explained that the report’s determinants looked at quality of life and assessed the changes of societies’ productive bases through produced capital, human capital and natural capital per capita. Prof. Duraiappah noted that although the initial IWR emphasized natural capital, subsequent research would delve deeper into human capital. Prof. Kazuhiro Ueta, Professor of the Graduate School of Economics, Kyoto University, delivered the final presentation on the “Significance and Challenges of the Inclusive Wealth Index”. The IWR is the first report assessing the sustainability of a nation’s economic growth from the angle of its productive base, and Prof. Ueta questioned whether economic growth enriches the productive base of a society when the wealth of a nation cannot be sustained with a deteriorating productive base. Comparing existing indicators such as GDP and the Human Development Index, which focus on income, the IWI is progressive in its use of a stock-based approach, which accounts for the productive base of a nation. However, Prof. Ueta also explored the IWI’s challenges regarding its measurement methods and international interdependence. The event finished with a question-and-answer session, moderated by Prof. Kazuhiko Takeuchi, Vice Rector of UNU, that touched on the challenges in using the IWI to assess such cross-border issues as pollution and human capital, the influences of political change, and how the IWI’s capital trade-offs and global standardization can be achieved using resources such as fair price trade databases. The presenters closed by highlighting continued IWI development and collaboration with international experts, India’s efforts to further improve the IWI, and a dedication to expanding IWI data to include more countries in future publications of the Inclusive Wealth Report. This event was organized by the United Nations University Institute for Sustainability and Peace (UNU-ISP), The Global Environment Outreach Centre (GEOC), The University of Tokyo-IR3S, the Sustainability Science Consortium and the Ministry of the Environment of Japan. The Inclusive Wealth Report 2012 was released by the UNU International Human Dimensions Programme on Global Environmental Change, the United Nations Environment Programme and other partner agencies on 17 June 2012 at the United Nations Conference on Sustainable Development.